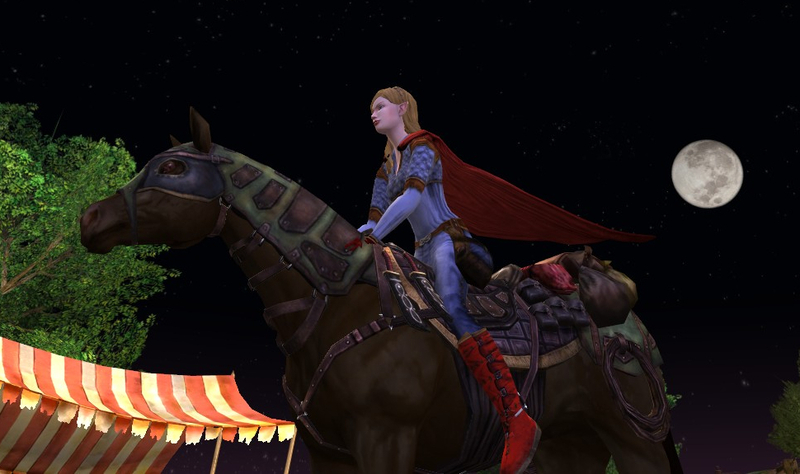 As we wait (and wait, mebbe today even...) for Summer festival, here is one of the newer Steeds… the Steed of the Burglar. 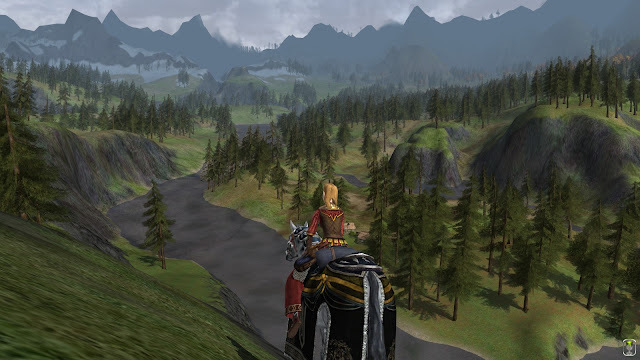 With 15 days until the Riders of Rohan, and a festival wedged in there (presumably), it is time to say goodbye to the Moors for a while. As contrast to a shot from a couple of weeks ago from the north, here is a view from the South, looking up the Hoardale River. Hoarhallow village is the only structure seen and is just off my right shoulder as I ride the Prized Isengard Great-horse. The Moors looks peaceful from here. 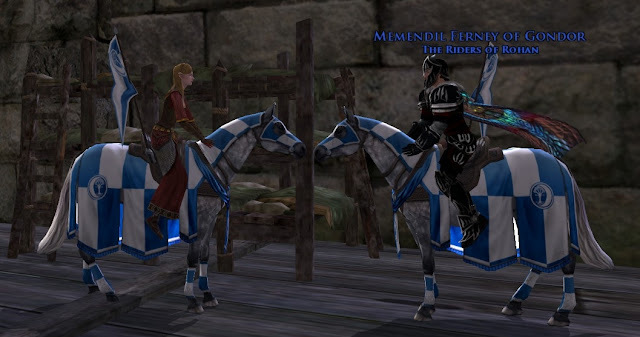 Memendil and I sit atop Steeds of Minas Ithil, reflecting on what has gone before and what is yet to come. I make a point to not be rude or say negative things about other people, but when most everyone, both Creeps and Freeps, agrees on something… a spade is a spade, even though Turbine has its head in the sand and has not implemented a policy. I consider it one of the worst infractions, worse than Gold buying (which is really stupid), and am glad to see unity against it. 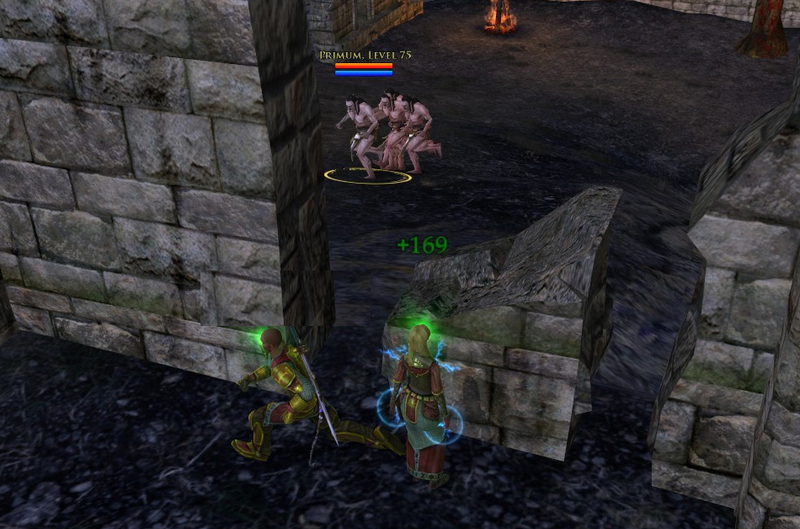 Unfortunately, multi-boxing is so disruptive, the only chatter in the zone is “where is the multi-boxer so that he might be killed?” and most activity starts to circle around "one" entity. If I were in charge, new policy would be in place and it would be forever banned in PvP zones. Until another day, I say goodbye to the dormant Rangers: Gelbes and Uirnen. 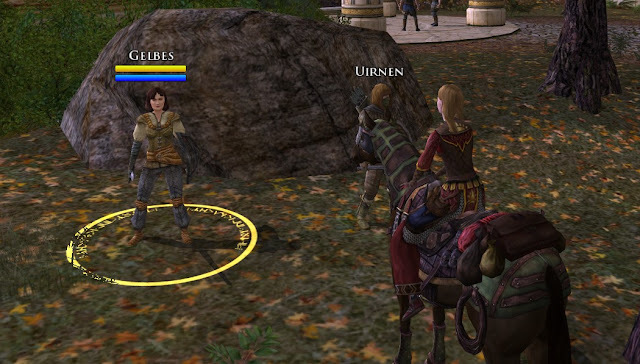 (In theory, when the Freeps are grossly outnumbered, a “ranger quest” should be available to take control of the ranger and try to help even the odds. Having only seen it work once, a long time ago, I think that it is in fact broken at this time.) May Summer Festival come soon. I've not heard of that happening... mainly the occassional fight clubbing going on on my server. The only thing I can think of is that it's someone who grinds commendations for people, as the fastest way to do that is to roll a greenie creep and do the introduction/run-around-the-map quests. Either for payment or for friends... it's just wrong. Did you try to report them? It is clear that macros are involved as he hits with all characters simultaneously. How does it help? Imagine getting hit with 10-12 wounds within 2 seconds... and thunked by arrows. It doesn't take skill or a brain (much less six) to walk around and try to basically one-shot non-tanks. Sure, we adapt and can deal with it in raid, but no other person has to be policed like this. One could argue that a group of people could focus. But they are not as coordinated as a computer macro handling the targeting attacks. It is hard to describe it better until you actually see it in action. 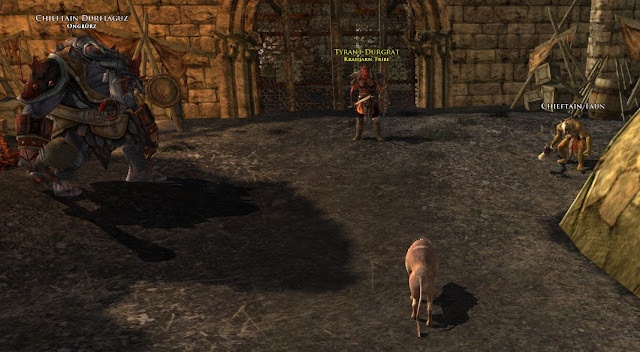 And as followup, I'm not opposed to all multi-boxing... if you want to go ravage North Downs or go do some synchrnized swimming in Evendim, go do it since you aren't impacting anyone else. But when it spills into an area like PvP where it changes the dynamic of the zone and all those who play there... that is not acceptable. Can't believe he got away with it. I know that people get banned for using macro's to farm or to do skirmishes AFK - I agree with you totally, there's no way this should be allowed! Ugh, yes, boxing. Boxing is one of the main reasons I don't go to the moors and, therefore, have little reason to stay VIP. (The other main reason is that I'm just plain bad at PvP :D) Complaints about it were falling on deaf ears > 1 year ago, sad to hear that there's still nothing being done about it. Yeah Ponylovers... just not much more to say... it is an obvious disruption, breaks the intent of the game, has strong likelihood to be a violation of the current ToS (because of the macros), yet Turbine does nothing about it. It is even a weak business argument to keep it. Since one can play creep-side moors for free, the cost advantage for carrying potentially non-paying customers at the loss of paying customers (such as yourself) would seem to be negative. I cannot go so far as to say I would ever stop subscription over it, but it also is a concerning alarm that something is wrong.